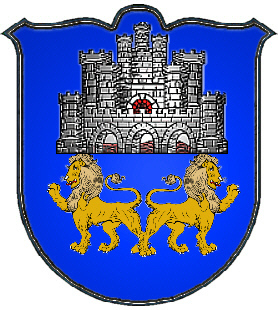 Coat of Arms: A silver castle, supported by two lions, on a blue shield. Crest: A green wolf and a crown. Motto: Turris Fortis Mihi Deus. Motto Translated: God is a strong tower to me. Supported. Said of an Ordinary that has another under it, by way of support. Supporters. Are figures represented on each side of the shield, and appear to support or hold it up. Supporters are used by the Sovereign, Princes, Peers, and Peeresses, Knights of the several Orders, and Nova Scotia Baronets. The English Baronets are not allowed this privilege, except a very few, who for distinguished services have received a licence to use them. The Sons of Peers, although using supporters, have no legal right to them, and I would remark that a somewhat foolish custom has lately sprung up. 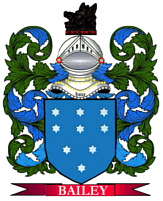 If a Peer intermarries with a lady belonging to a family whose arms have supporters, he places one of the supporters of his own coat on the dexter, and one of the supporters of the coat belonging to her family on the sinister side of his shield ; yet it is certain by all the rules of Heraldry that a woman can in no case convey supporters to her husband, and that even to convey them to her children she must at least be a Peeress in her own right. Supporting. Sustaining, or holding up.